Kids Game Ideas Using Noodles? 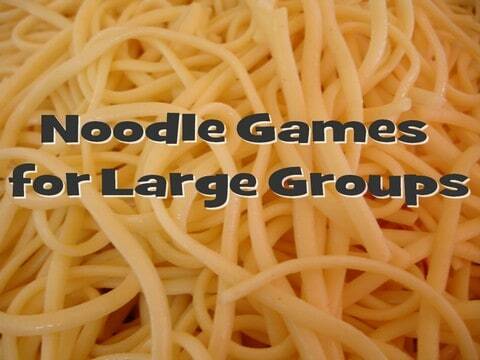 A couple of week ago I decided to do large group games for Awana on Wednesday nights all centered around noodles – mostly pasta but also some pool noodles. Don’t ask me why I chose to do a pasta night (there’s a long story there), but I did. It turned out to be both challenging (as it is any time you try something new with such a large group) and fun. I thought I would share the games with you in case you ever have occasion to do a pasta themed night. This might also be handy to put in your Vacation Bible School file. Teams line up on one side of an auditorium and run a basic relay race from one side of the gym to the other and back. The only catch is, if the spaghetti noodle breaks, your team is disqualified. If that is too easy, have the teams add penne noodles on top of the spaghetti noodle, and only allow them one hand to hold the noodle. If you have enough pasta, have them hold it in their mouths with the penne noodles on it. Players fill buckets at mid-court by carrying elbow macaroni on the back of their index finger (or their forehead, or whatever else you choose). Only one noodle per trip. Most noodles in bucket wins. If the noodle falls, the player must pick it up and run back for his next teammate to go. Most pieces in bucket at end of set amount of time wins. Each team picks one player. One at a time each player must put a spaghetti noodle in their teammates hair. If the noodle breaks or any part of another noodle falls out of the hair, the noodle does not count, and the next person on the team must go. Most noodles (as counted by a leader), wins! This is a relay race where each team member must hit a pasta noodle with a pool noodle all the way down to the other side of the gym and back. The player may not touch the noodle with their hands or feet. Two players from each team run down court throwing a noodle back and forth (no handing noodle). Only the player without the noodle may move. If the noodle falls or breaks, that pair must start over. Each player must move a noodle down the floor and back using nothing but their breath. Players must walk the length of the gym with a noodle balanced on the end of a pool noodle (we actually used pool noodles cut in half). They may not touch the pasta noodle with their hand. If the noodle falls, they must stop where they are and re-balance the noodle on the end of the pool noodle before they can move on. The team whose players finish first wins! Let me know if any of you use these games or come up with any other varieties. Chocolate night is coming up again soon, so it will be time once again for The M&M Gauntlet! Tony Kummer (Editor) reviewed & updated this page on : April 1, 2011 at 10:16 am. All our content is peer reviewed by our readers, simply leave a comment on any post suggest an update.